Exchange Family Center's Annual Golf Tournament is our longest running event. The tournament occurs every year in the fall. This year marks the 49th Annual Golf Tournament which will be held on Friday, September 21st, 2018 at The Crossings Golf Club. We hope you will join us! You will have chance to win amazing raffle and door prizes, as well as, a chance to win a brand new car (compliments of Auto Finders, Inc). Breakfast and lunch will be served along with cold bear and other refreshments. We are still in need of volunteers so if you are interested in helping out, sign up here. You will be able to easily see what slots are available and the where we need extra hands. 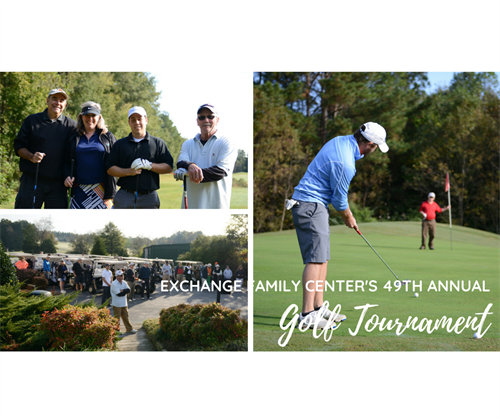 If you would like to learn more about the golf tournament or are interested in becoming a sponsor, please contact Calvin at (919) 321-0657 or at calvinb@exchangefamilycenter.org.